The Federal Board of Revenue has suggested changes to the way Pakistanis are taxed. If the government approves these proposals, people on salaries will see a cut in their pay cheques. The cabinet has gone over the changes, at the heart of which lie proposals to revise the minimum level of taxable income. Right now, you don’t have to pay tax if you earn less than a total of Rs1.2 million a year. If you fall in this category all you pay is a flat rate of up to Rs2,000. This will change under the new system. 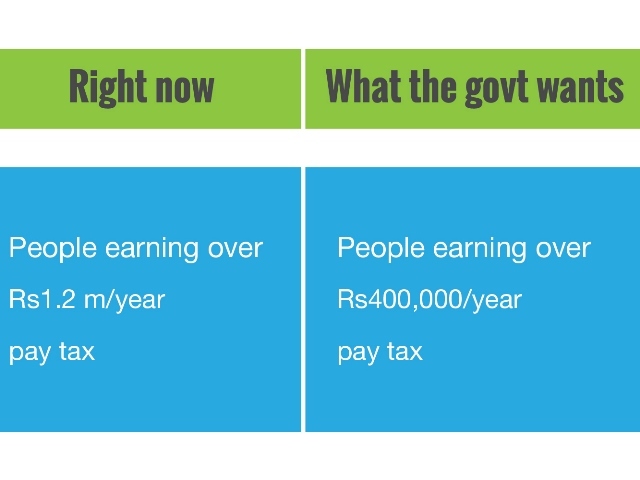 You will pay tax if you earn over Rs400,000 in total each year. So if the changes are made, if you earn Rs100,000 a month, your boss will cut Rs3,333 from your salary as opposed to the Rs166 cut under the rules now. The amount of tax you pay goes up as your income goes up. Green: the tax (fixed amount) you pay on this part of your income. Blue: the rate of tax you pay on every rupee above the green part of your income. 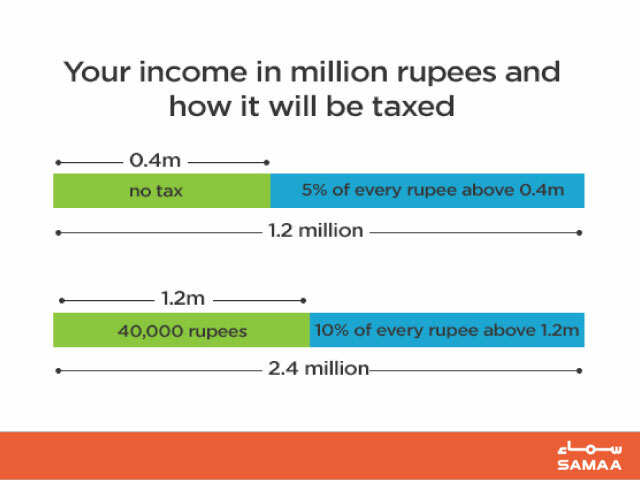 The above graph explains only two of the six income tax brackets the FBR has proposed. 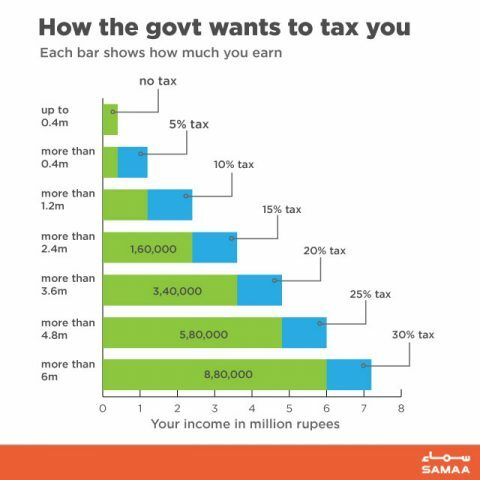 If your income is more than Rs2.4 million per year, you can find out your tax amount with help of the following graph. Why are you paying more taxes? If the government makes these changes, your ability to buy things will go down. This is because the FBR is not doing its job right. People on salaries are the easiest target for a government. If the government wants to earn more in taxes it just needs to get employers (companies) to take away the tax even before your salary is transferred into your bank account. Your employer is basically acting as a government agent. There is no way you can escape these taxes. The real question is, what about people who earn but are not salaried professionals? If the FBR was doing its job, it would be going after business people and businesses that cook their books and show losses to avoid paying taxes. It hasn’t been able to crack down on the informal undocumented economy. Think about the beauty salon in Karachi’s DHA that only takes cash, not cards. The FBR has not been able to make more people in Pakistan pay taxes. It falls back on easy ways that don’t need hard work. This is why it is ratcheting up taxes for people on a salary and documented businesses, by cutting income tax in advance. This is why it is taxing you when you buy products and services (such as petrol and mobile phone credit). These indirect taxes, such as sales tax or petrol tax, are deducted by your vendor or service provider, which also act as government agents. It is easy money for the government and accounts for two-third of its tax revenue. The government spends Rs2 trillion more than what it earns in Pakistan. This shortage forces it to borrow money from banks and international lenders so that it can spend on development projects and pay for its day-to-day operations (including salaries of government employees). 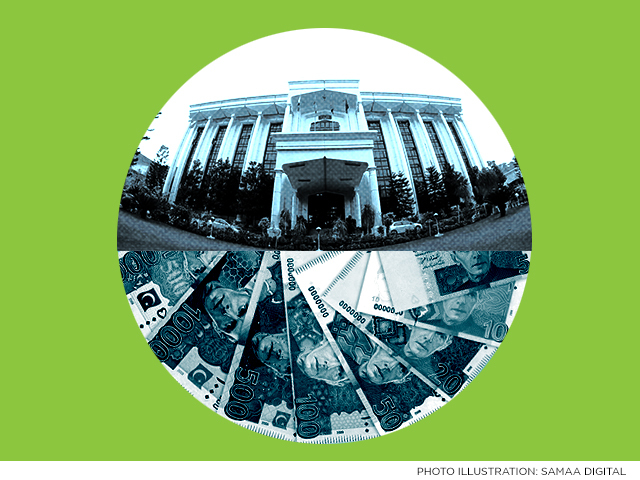 It is in heavy debt (Rs27 trillion) and pays Rs6 billion every year in interest payments alone. That is why it is making these changes to the way we pay taxes, so it can increase its revenue. These proposals are under consideration. If approved by the Cabinet, the finance minister will present the revised finance bill, which includes these proposals in the National Assembly on September 18. If the NA passes the bill, these changes will be implemented. Critics say these changes can help the government earn Rs70 billion more. But, if it reduced taxes and cut its own expenses 5% it would have 5 times more money than this. They say that if people pay less in taxes, they will have more money to spend, which can translate into higher sales taxes for the government, an alternate way to earn than taxing incomes.